My thanks go out to Steve and Timi at MX Publishing for my copy of this book. You have been unbelievably kind and generous! 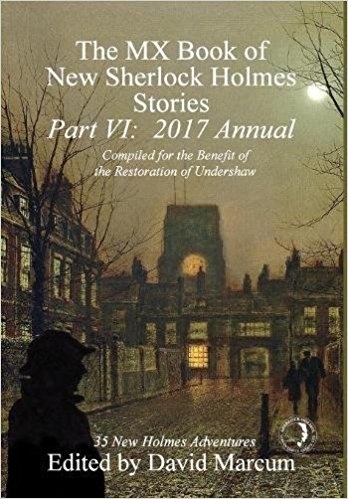 This, the 6th volume in this ongoing outpouring of new Holmes stories, contains 36 new takes on Arthur Conan Doyle’s super sleuth! Readers of this series will be pleased to see many returning authors. David Marcum not only edits the volume but has a short story to share. Also returning are Derrick Belanger, Hugh Ashton, Geri Scher, Molly Carr and David Ruffle, and many more! Holmes has many new cases and takes on some of the “mentioned but unrecorded” cases from the Canon. Old enemies sometimes return, and new malefactors are in great supply. Watson is sometimes married, (like as not to someone previously unmentioned,) working hard at his practice, or fully or partially retired. Holmes is fully or semi-retired, still taking cases, or being exploited by Mycroft for affairs of the Kingdom. I think that the tales are often strong adherents to the Conan Doyle blueprint of writing. A few do explore new avenues, but all are Holmes and Watson still playing the game. I give “The Adventure of the Apothecary’s Prescription” by Roger Riccard the title of “Best in Book!" We desperately need new stories that connect to Professor Moriarty! A close second is “The Adventure of the Cat’s Claws” by Shane Simmons, a new look at Doyle’s “The Adventure of the Veiled Lodger.” The story I give “Worst in Book” is Jim French’s “The Adventure of the Apothecary Shop” by Jim French. Egad! I hate trying to read plays! Each volume of the MX Book of New Sherlock Holmes stories promises adventure and solving mysteries by deductive reasoning! This is Volume six and the promise continues to be kept! I gladly give this volume five stars plus! I am looking forward to more such volumes to come!